"The first three months are the most exhausting", someone warned Christian - a German psychotherapist newly arrived in Minsk. How right they were. Five international colleagues and around 20 Belarusian employees. This is our team. After meeting everyone in the first week, I went to Moscow for a briefing at the head office for two days. Then the work started. My wonderful predecessor, Katherine from Canada, had just three days to hand over a year of work as well as her shared room in our staff apartment, then she had to depart. So now, here I was. A project in transition, five employees looking expectantly at their new "boss", masses of information to be processed, and day-to-day business that needed to be kept up and running. The most important person quickly became Hanna, my wonderful translator, who helps me in literally all circumstances. And, with angelic patience, communicates what I want to say. What followed were the most exhausting and most instructive weeks of my professional life. Every phone call and every conversation is translated simultaneously. Every email exchange goes from English to Russian to English. Apart from Hanna, Team Minsk consists of tuberculosis (TB) doctors, nurses, psychiatrists, psychologists, social workers, logisticians, administrators, technicians and drivers. We advise staff and doctors in TB and outpatient clinics. The structures here mean we cannot treat patients directly or prescribe medication. So, we always work together with the local staff on behalf of the patient, which is both a challenge and an opportunity. In the morning we drive from our shared flat to our office on the outskirts of Minsk, which is less than 500m away from the tuberculosis centre. Everyone rolls in, and, after between five and ten “Dobre utras” (good mornings), I discuss the day with my colleagues, the senior physician and the senior psychiatrist. When I get to my office, Hanna is already there as coworkers come in and we briefly discuss the patients. Thirty minutes later, it is quiet. The first three months are the most exhausting, Katherine said. How right she was. Everyone is on their way to treat patients in one of the three outpatient centres in Minsk or in the “closed clinic”. This is where patients who – for various reasons – do not engage with their TB treatment, have been sent to attend by a judicial decision. Since the beginning of our project in 2014, one of the key successes is that all parties involved now endeavour to prevent this last step. Unfortunately, however, this is not always possible. In some cases involving people from disadvantaged backgrounds or with addiction problems, patients do not recognise the need for their treatment or are simply overwhelmed with the complex procedure. In our daily work, through information, support, groups and individual therapy, our team helps patients to follow their treatment consistently. 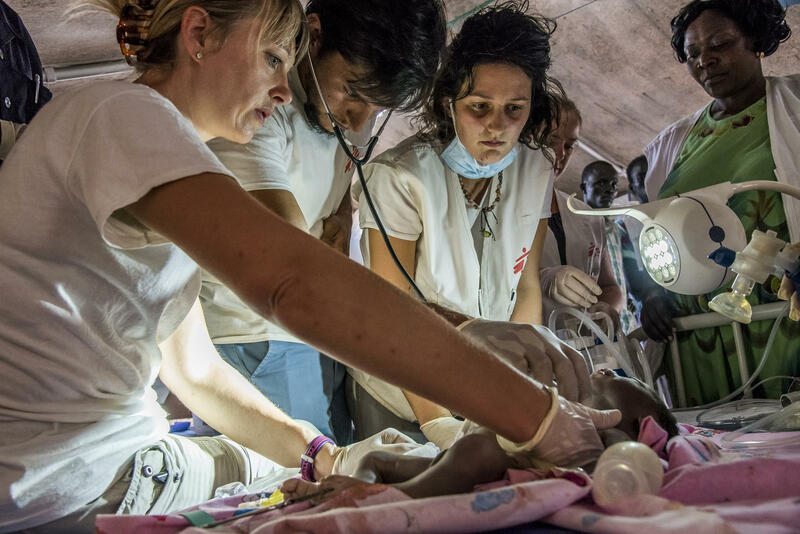 MSF provides access to essential medicines and treatment for disadvantaged people who would be doomed without our help. When everyone is swarming off to see the patients, my administration work begins. Logistics, controls, statistics, the design of learning and patient materials, voting and telephone calls. We are systematically working towards the day when things are ready for MSF as an organisation to leave Belarus – be it in 10 months or 10 years. Until my team comes in again, I keep myself updated with the “field”. I talk with ward and senior physicians and enjoy the care and companionship of colleagues. By 4pm, everyone is back. The office is full and it’s a busy time for information gathering, evaluation and team discussions. At 6pm, Andrei (our driver) drops us again at the shared apartment. As always, I have my laptop. The day was so busy that almost all my emails are unread and there is still a lot of work to do at home. Finally, by 9pm the computer is off and a long day is done. I'm tired, but everything is fine.